We went into Leeds on the Thursday which was the first day that the Birra Moretti Gran Tour was on at Leeds Town Hall... After stress, anxiety trying to defeat me and other things due to many reasons, we made it to Leeds Town Hall. We saw a sort of map post thing with destinations within Italy pointing to a different direction. I stopped really noticing it and just went from vendor to vendor. This meant that we ended up queuing at Pasta E Basta first. P&B use ingredients that haven't travelled far which is pretty impressive. Pasta E Basta has been going since 2012 via Fabrizio and his wife, They even make their own pasta which is pretty amazing as making fresh pasta takes some time! 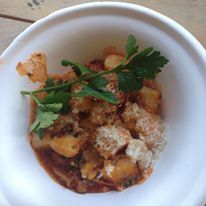 I ordered two servings of gnocchi with pulled pork from what I remember... There was some Parmesan grated on top to make sure that it echoes the authenticity of Italy. The pasta was amazing. It was al dente and I loved it. I could tell how much love and effort was put into it. The pulled pork was so tender and lovely. The flavour that it gave off was husky yet sweet with a lot of depth. It was so delicious! You can find Pasta E Basta via markets in London! The next place that I went to was Tigellae. Tigellae is very well known for bringing Italian street food to people but in a way that youve never tried before. I egot fusilli with Birra Moretti braised pulled pork with honey, balsamic vinegar and herbs. The fusilli was perfectly cooked. The Moretti gave it a slight kick but gave it a slight bit of sweetness to the pork. The honey added to the sweetness but mixed with the balsamic to take a slight bit off the edge of the acidity of the balsamic. I love balsamic and pulled pork so the mixture of the two with pasta was heaven in my eyes. The herbs added a slight freshness to the dish as we decided to eat everything al fresco (outside) mainly because the weather was amazing and inside was slightly packed for my liking. You can find Tigellae within Greater Manchester. The next vendor that I visited was the Arancini Bros. I have been wanting to try arancini balls for such a long time. I finally got the chance to try them out. The Arancini Bros consist of two people 'Big' Dave & 'Little' Dave. The guys started via a small market and then made their way via selling in more places such as festivals and other places. 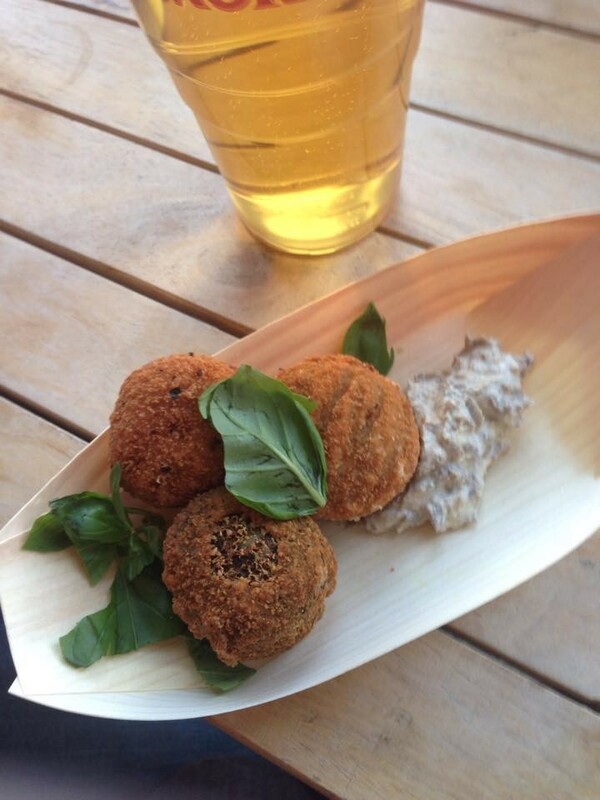 Arancini and festivals sound like a match made in heaven. They ended up taking over an old cafe and now have three shops and even though their business is Italian they actually met in Australia where they were working together as they have been working in restaurants since they were 16. I got a mixture of mushroom, tomato and spinach arancini with mushroom pate to dip them into with strewed basil on the side. The tomato one reminded me of a rich tomato sauce maybe made with a strong tomato puree mixed with the creamy risotto. The spinach one reminded me of the Italian stuffed pasta that I have sometimes so I could tell it worked and I love spinach when it's paired with something creamy. The last arancini was an unexpected one. I love mushrooms but I've never had mushroom risotto weirdly so I wasn't sure what to think of it but the interior reminded me of a strong mushroom soup. I loved it as the interior was creamy with chunks of mushroom where as the exterior was crispy and different which made it extra delicious. The mushroom pate gave a contrast of textures due to the crisp outside of the arancini and the smoothness of the pate. The pate tasted of mushroom but there was a underline of sweetness to the pate which made me want more and I love basil. Basil, mint and coriander are my favourite herbs so I loved it especially with the tomato arancini. During all of the vendors, I was drinking Birra Moretti. I normally don't drink beer but this beer was delicious due to many reasons. One being the gorgeous weather that it was outside and another was the fact that the crispness of the drink went amazingly with all of the food. At this point, we had to go so we decided to drink up and walk down the vintage stone steps. We decided to get a gelato each from Brio Gelati. 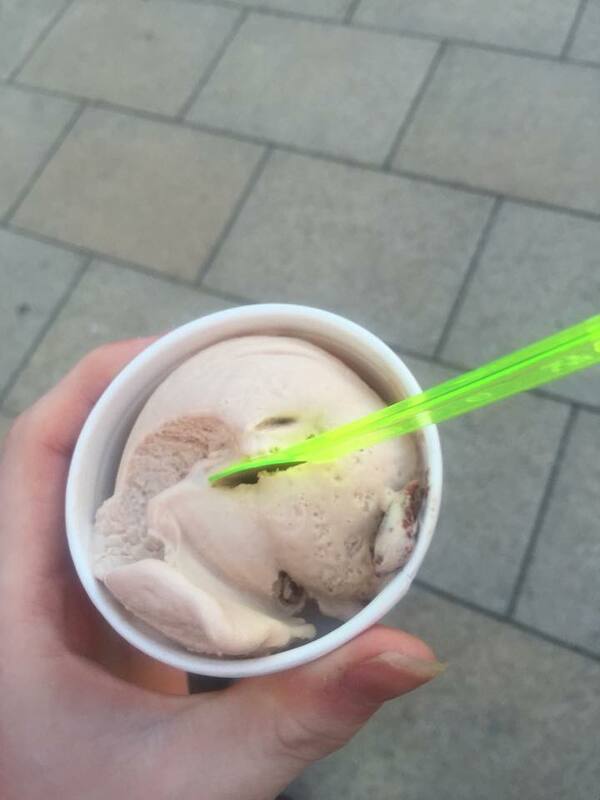 Brio Gelati was founded by Gianni who moved from Italy to Leeds and makes delicious gelatos. I tried Chocolate Nutella because this screamed out to me when I went to the stall... The chocolate wasn't too strong but you could tell that there was a decent chocolate flavour within the gelato but then came the swirls of Nutella within the gelato which were amazing as they created a bit of texture via the crunchy hazelnuts within the creamy gelato. Was sensational. We said our goodbyes and left. 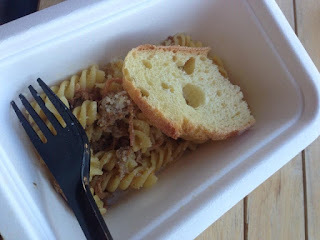 I had a lot of fun at the Birra Moretti Gran Tour and I hope you went and sampled some of the amazing food that was on offer whilst it was on at Leeds Town Hall. I hope you have enjoyed my blog post and I hope to see you next time for another blog post! I would also like to thank all the vendors even the ones who served food that I didn't get to try for cooking so many times during the Birra Moretti Gran Tour and you all deserve a lot of appreciation!